Experience John’s Island. See why it’s ‘great to be here’! The more things change, the more they stay the same. So it is at John's Island, where the original mission of creating a private, family-oriented community for those with discerning tastes, continues to evolve. Today, John's Island is a 1,650-acre (3,200 acres including wetlands), barrier island masterpiece situated within the quaint town of Indian River Shores in Vero Beach. Homes have been strategically placed to preserve old oak trees. A rare and cherished three miles of private beach access and over nine miles of Intracoastal Waterway exposure make John's Island a playground in paradise. Careful preservation of the pristine natural surroundings ensures this paradise will be as breathtaking in the future as it is today. 1715 – Survivors of the Spanish Plate Fleet set up a salvage camp on what is now the northern boundary of John’s Island. 1844 – John’s Island was first surveyed to have a record available to describe the land that might be acquired under the Armed Occupation Act of 1842. 1872 – The first pioneer to settle on John’s Island was Allen Estes. 1880 – A farmer named John La Roche arrived on John’s Island. He selected the island because of farming, and it represented the shortest row to the mainland, and eventually the railroad. He settled on a 300-acre island on the Indian River, known today as “The Island of John’s Island”. This island was the original John’s Island named after John La Roche. 1889 – On June 21, John La Roche filed homestead papers for 138.5 acres on John’s Island. Apparently he was not only a farmer, but an imaginative real estate man. He sold lots at $25 an acre. 1890 – A detailed survey was made of John La Roche’s property in March by R.B. Burchfield. The name John’s Island was first used. 1891 – Brothers, William and Calvin Reams, arrived to John’s Island as one of the earliest settlers. They were among 12 to 15 families that settled in John’s Island. Calvin gave land for the two churches and singing school. Calvin’s son remained in John’s Island for 27 years. 1892 – On September 25, a post office was established on John’s Island. It was called Reams. 1900s – The small community founded by John La Roche prospered with some 200 residents, a Missionary Baptist and Primitive Baptist church, and a school known for its singing, taught by Felix Poppell. 1925 – Residents deserted the 300-acre island and moved to the mainland due to the advent of the railroad and opportunity for employment other than farming beans. The general economic depression of 1929 terminated any planning of luxury development during the Florida boom, and the area reverted to its natural jungle state. The old cemetery still exists where the original settlers are buried. 1953 – The town of Indian River Shores was created on June 15, House Bill No. 1691. John’s Island’s principal architect, James E. Gibson, designed the municipality’s Town Hall. Fred R. Tuerk, onetime Chicago broker and president of the Chicago Stock Exchange, acquired the island and, parcel by parcel, assembled the 3000 surrounding acres of land. Tuerk specified that it be sold only to a man “with respect for the land and the ecology”. 1958 – A1A was built from Beachland Boulevard to just one-half mile north of Wabasso Road. 1967 – Fred R. Tuerk died in February without seeing his dream fulfilled. 1969 – Tuerk’s heirs, cognizant of his love for the property, sought to find a purchaser for the 3000-acre estate. The buyer they were seeking would respect the environment and its natural beauty. The man they found was Edwin Llwyd Ecclestone, Sr. He had demonstrated a profound commitment over ten years prior, when he founded and developed Lost Tree Village in North Palm Beach, FL. In the mid-1960s, however, Ecclestone was so deep in debt at Lost Tree – he had mortgages with five banks at one point – he almost gave up on the development. His decision to remain was the smartest move he made. 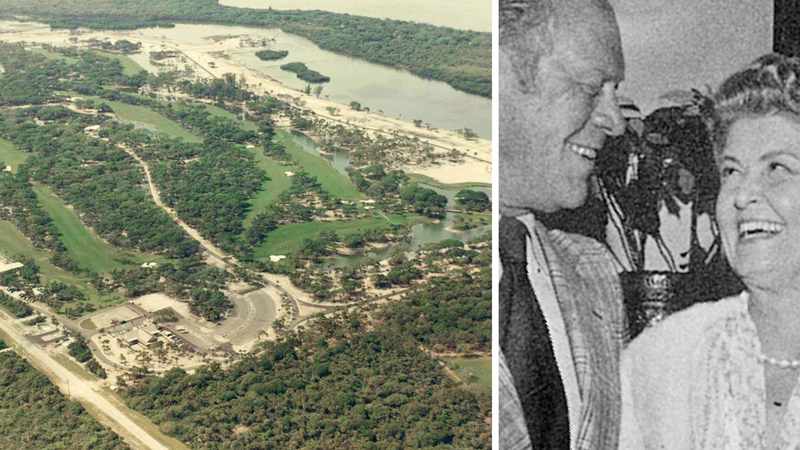 1969 – March 28 – Mr. Ecclestone, at age 67, undertook a long-term plan for the development of a unique and private, residential family Club community that would fully preserve the beauty of the land and the legacy of the past – John’s Island. He knew the need for a championship golf course. So he hired Pete Dye and consulted with Jack Nicklaus to build the South Course...at least that's what the signs said. According to Alice Dye, Pete's wife who accompanied him on the many trips to John's Island, "Jack never helped Pete on that course. Jack could never get a contract signed by Ecclestone, so he never got paid and never did any work." Under Ecclestone's guidance, John's Island became quite a success. One key move was hiring Errie Ball, a head professional from Chicago who had the distinction of playing in the first Masters. According to Alice Dye, once JI got Errie Ball, everything changed. He brought a lot of wealthy people down from the Midwest that really helped change the atmosphere at JI. Ground was broken in March of 1969, and the first round of golf was played on the South Course, in December of that year. The South Course was designed by Pete Dye in consultation with Jack Nicklaus. At that time it was called “The Bayou”. Construction began shortly thereafter with the Administration Building and Golf Clubhouse. Town Island Builders was the only builder at that time. Mr. Ecclestone’s son-in-law, Mr. Roy Chapin III, was the General Manager of the property. A very young and active sales force was formed and was the core of the John’s Island development. 1969 – May 16 – the official “Ground Breaking” ceremony takes place at 10 a.m. One of the first golf cottage owners was Mr. and Mrs. Paul Boden at 163 Silver Moss Drive. One of the first homeowners was Mr. and Mrs. William Kolb at 280 John’s Island Drive. 1970 – The original Golf Clubhouse was built. It was designed by the noted James E. Gibson, AIA; one of the country’s leading classical, Georgian architects. His works include the Henry Ford Centennial Library, The Detroit Institute of Arts, and a number of estates in Gross Pointe and Palm Beach. 1971 – The second 18-hole golf course designed by Pete Dye, called the North Course, begins development. John’s Island is the first Club to offer two 18-hole golf courses in Florida. 1972 – The new Indian River Shores Town Hall was dedicated in December. 1981 – Sadly, E. Llwyd Ecclestone, Sr. died of cancer. Although he did not live to see the culmination of his dream, his spirit is ever present as he rests in the old cemetery at John’s Island. His daughters, Helen Ecclestone Stone and Jane E. Chapin, took over and fulfilled the dreams of John La Roche, Fred Tuerk and their father, in a way no one could have envisioned. Later, Helen Ecclestone Stone took the reins and developed Gem Island, a 79-acre island within John’s Island in 1989. 1982 – In December, 17 months after E. Llwyd Ecclestone’s passing, permits were granted and John’s Island was released for purchase. 1986 – January 1 –John’s Island Club was organized and purchased by the membership from Lost Tree Village. Later in December, Mrs. Jane Chapin sold her interest in John’s Island to her sister, Mrs. Helen Ecclestone Stone, who became the sole owner and developer through Lost Tree Village and John’s Island Real Estate Company. 1987 – A prudent decision was made to hire top architect Tom Fazio to design a third course, six miles west of John's Island, fittingly called The West. Building another course was the kind of perk needed to convince the members to buy the Club from the owners. Fazio built a gem on the West Course, where he could rely on a natural sand ridge he spotted 20 years ago when he was designing Jupiter Hills to give the layout elevation change seldom seen in Florida. "The property was magnificent," Fazio said. "And the Club gave me almost everything I asked for." The West Clubhouse was built on John's Island's West Course. John's Island's third 18-hole championship golf course, designed by Tom Fazio, is over 300-acres. The land was selected because of its natural, spectacular north/south sand ridge with elevations up to 50 feet. Designed “green,” there are no homes built around it. The land for the West Course was purchased by John's Island and most specifically by the Ecclestones to build a third course to sweeten the Equity Conversion deal that was on the table with the members. John's Island Club knew down the road that in sheer size alone they would need a third golf course. The land was spectacular and built on the same dune line as Seminole Golf Club. It had a lot of elevation change and Tom Fazio could deliver a gem. This dune line was the oceanfront more than a million years earlier! Because of the great elevation (by Florida standards) they moved just 400,000 yards of fill, whereas a typical Florida course moves between 1.2 to 1.5 million yards of fill to achieve elevation change. The Clubhouse was built on the original elevation of approximately 51 feet...pretty special because you can see so much of the course from this height. The original design for the 18th hole had "dental bunkers" in the face in front of the green. It would have been awesome but the members felt it would be too penal. The rest is the result of the genius of Tom Fazio...short 11th hole so that any member could make a par, the par three over the water so that everyone in the Clubhouse could watch...the 17th hole being split so two options were provided the golfer – go up the slot and maybe get on in two or the safe way with the conventional three shots. Fazio always told me that he wanted to design a course like this in Florida because it did not look anything like a typical Florida course. Just by luck Hawks Nest was built at exactly the same time. There may have been a great rivalry between Tom Fazio and George Fazio (his cousin) to see who could give the members the best course. I think Tom won but I'm a little biased...they both are very special. 1989 – The opening of Gem Island, the last developed area in John’s Island and considered the "crowning jewel". The 79-acre island offers prime riverfront estates and homesites. 1994 – Demolition of the first Golf Clubhouse begins. 1995 – The newly designed Golf Clubhouse is complete. Architect: Childs Bertman Tseckares Inc (Boston, MA); Builder: Weitz Construction; Interior Design: Bierly & Drake. 1999 – October 29, Lost Tree Village sold John’s Island Real Estate Company to current owner, Bob Gibb. 2004 – The West Course received certification in the Audubon Cooperative Sanctuary Program for golf courses. It is also ranked amongst the most challenging in the nation. There are no homes or man-made berming. 2006 – The Club’s world-class North American Doubles, air-conditioned squash court was built. 2007 – Demolition begins on the original Beach Club. Two croquet courts were built at the West Course, off campus. They meet the standards of the U.S. Croquet Association. 2008 – Completion of the new, world-class Beach Club - just in time for the opening weekend festivities. Designed by architects Peacock + Lewis (Palm Beach); interior design by J Banks Design Group, Inc (Hilton Head, SC), and built by Weitz Company, LLC. 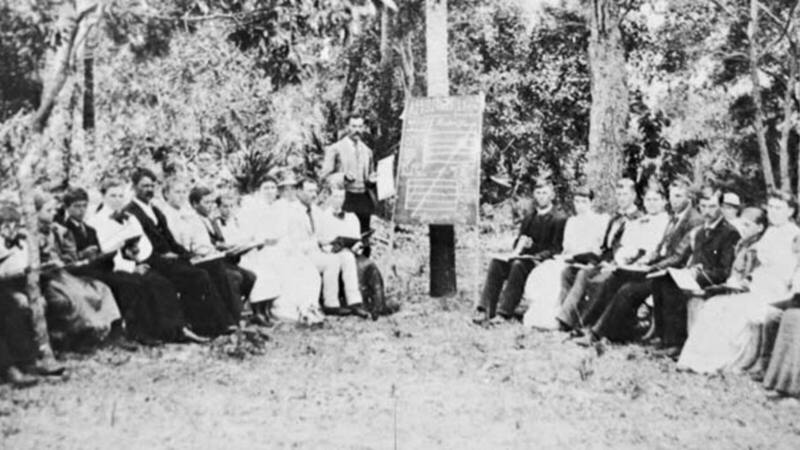 2009 – 88.9 FM WQCS/Indian River State College aired a short segment about the early settlers along the river near Winter Beach and John's Island. Listen here. Cassie Virginia Walker was a young girl when she moved to John's Island with her parents around in 1914. When she had her own family, they moved to Winter Beach with their eight children. One of their sons and Lucie Warren, one of their daughters, and are featured in this fascinating interview. 2011 – November – Just in time for the season's opening weekend, members enjoy the new singles squash court (enhancing the existing double's squash court) and a completely renovated West Clubhouse. The makeover project provided stunning views of the West Course through enormous picture windows and a desirable outdoor terrace for al fresco dining. Providing a 'peaceful oasis for golf enthusiasts', this successful renovation was made possible by the following key players: Tommy Farnsworth, president of the John’s Island Club when the decision to renovate the facility was made; Connie McGlynn, chairman of the Facilities Committee, and committee members Laura McDermott and Terry Young; architects David Moulton and Scott Layne of Moulton Layne P.L. ; Janet Perry, lead designer with J Banks Design Group; project manager Charles Croom of Croom Construction; landscape designer Warren E. McCormick; Brian Kroh, John’s Island Club general manager; Rex Wilson, John’s Island Club facilities manager, and Greg Pheneger, John’s Island golf course manager. 2012 – At the February 23rd Town Council meeting, long-time municipally active & JI resident (& JIRE agent) Jack Mitchell was honored with a beautifully mounted Proclamation as well as having 'Colonel Jack Mitchell Way' named after him. The newly named "Way" is that portion of Fred R. Tuerk Drive which turns North and leads to the John's Island (South) Gate. 2013 – The first ever professional squash tournament in Florida was held at the John's Island Club during the weekend of April 18-21. Top seeds Suzie Pierrepont and Narelle Krizek rallied to a 17-18 15-11 15-5 18-15 victory over second seeds and recently-crowned U. S. National Doubles champions Dana Betts and Steph Hewitt Sunday afternoon in the final round of the inaugural $25,000 John’s Island Open. 2015 – October 1-8: The John's Island Club proudly hosts the first USGA "Major" played on the Treasure Coast. A first for the Club and for Florida, the 35th USGA Mid-Am Championship showcases 264 players competing at John's Island Club's West Course. The Mid-Amateur is open to amateurs age 25 or older with a USGA handicap index of 3.4 or better. The winner receives the Robert T. Jones Memorial Trophy plus an invitation to the 2016 Masters Tournament at the Augusta National Golf Club. Read Press Journal article. Thanks in part to a timely ace on a par-4, Sammy Schmitz defeated Marc Dull, 3 and 2, to earn his first USGA title. It was the first hole-in-one on a par 4 in a USGA amateur competition since Derek Ernst's ace on the 299-yard eighth hole at Bandon Trails in the Round of 64 at the 2011 U.S. Amateur Public Links. 2015 – October 17: John's Island member, Michael Pierce, is inducted to the US Squash Hall of Fame in Chicago. His primary on-court achievements come on a doubles court. One of the best left-wall players in history, Pierce won dozens of professional and amateur titles and is still the only player to ever win the U.S. national open, 40+, 50+ and 60+ tournaments. Pierce has been a significant leader off the court, as president of the Philadelphia district, builder of courts in Florida, tournament director, benefactor of urban squash and supporter of US Squash. 2015 – November: John's Island Real Estate Company unveils their newly renovated office with a fresh, new look, reflecting the best of what John's Island has to offer. 2016 – March 6: By popular demand, the John's Island Club's grand opening of four new, lighted pickleball courts at the main Tennis complex was a hit, with over 200 people attending. The beautifully landscaped setting includes a rest area with a cozy firepit, sure to please all ages! 2016 – May: Exciting, new renovations begin at the Golf Clubhouse to offer several al fresco dining options, a wine bar, fire pits to enjoy starlit evenings, and the added convenience of a Market Place, stocked with epicurean delights and a variety of beverages. The classic architecture will remain, but will be enhanced with touches of today's modern design elements throughout. The attractive casual dining options will encourage members to stay after a round of golf and grab a bite while enjoying picturesque sunset views overlooking the 18th fairway and lake of the South Course. John's Island Club continues to attract new members by investing in their word-class amenities. To be completed by mid-November for opening weekend. 2016 – November 19: The John’s Island Club celebrates with a grand Re-Opening of the Golf Clubhouse. After six months of renovation work, members and their guests come together for an open house style party. The vision incorporates timeless architecture and interiors reflecting the surrounding landscapes. Al fresco dining, fire pits, a wine bar and a market place set the stage for new traditions. Designed by architects Peacock + Lewis (Palm Beach, FL); interior design by J Banks Design Group, Inc (Hilton Head, SC), built by Weitz Company, LLC. (Palm Beach, FL), and landscape by Warren McCormick (West Palm Beach, FL). 2018 - September: Two additional pickleball courts are added, for a total of six, brand new, lighted courts and a firepit nearby for added comfort. A newly renovated Health & Wellness Center is a welcomed amenity. 2018 - October: An extensive renovation to the entire South Course is complete. 2019: John's Island Club and John's Island Real Estate Company celebrate their 50th anniversary! What is 20 + 12?